Tim Hoff has maintained his BUY call after a clean 1Q19 production of 98.6koz (DBe 100koz) and has lifted his forecast FY19 NPAT 6% due to lower costs at Gwalia. Tim highlights that although Gwalia production missed on tonnes Simberi made up for the missing ounces. Gwalia production of 62.7koz was lower than our 71koz forecast, likely due to lower mined tonnes while the PAF plant was being installed (SBM doesn’t pre-release tonnes milled). Grades fell 11% QoQ to 11.8g/t beating our estimate of 11g/t, which is a positive given guidance of 10.5g/t in FY19. At an annualised rate the operation is tracking at the mid-point of 245-260koz guidance (DBe 263koz). Simberi made up the missing ounces, producing 35.9koz (DBe 29koz) with a grade of 1.45g/t lifting 14% QoQ (DBe 1.25g/t). At an annualised rate of 143koz the operation exceeded its guidance range of 105-115koz. Encouragingly SBM have maintained group guidance of 350-375koz (DBe 385koz). Cash of A$350m was higher than our A$340m estimate, largely due to the dividend reinvestment plan where A$14m of the A$42m was reinvested. At current prices SBM is trading at 0.84x P/NPV, and Tim has maintained BUY on valuation with a target price of A$4.20. Anthony Hoo was pleasantly surprised at yesterday’s BOQ result, as 2H numbers were stronger at the bottom line than he expected. The stock traded up as investors liked the margin outcome of 1.98%, vs Anthony at 1.94%. Even after excluding one off benefits of 2bps, the underlying NIM was stronger than Anthony was forecasting. However, it was not all good news, as BOQ experienced a 7% hoh decline in other operating income, as well as significant below the line write-offs. BOQ’s capital position came in slightly below our forecasts but it remains in a comfortable range and is a key attraction for the stock. Other positives were asset quality, which remained sound; impaired balances down 5% hoh and the mortgage portfolio saw a small 1bp reduction in 90 days past due. Anthony retains his HOLD and $11.00 price target. Lee Power retains his BUY rating on JHX following its US peer’s(Lennar) Q3 result. Lee notes that order growth was slightly below guidance for Lennar, but Lennar management suggested that underlying fundamentals that support a healthy housing mkt (low unemployment, consumer confidence etc) should continue to support growth longer term. Turning back to JHX, and Lee believes he has factored in enough risk to any short term drop in order growth. Lee’s thoughts are in line with Lennar management, in that the LT growth drivers remain in tack. Lee also retains a $23.60 Target Price. And it was also reassuring to hear the feedback from Nishu Sood and team post the DB Annual Bank Leverage Conference earlier this week. Nishu met with 12 building sector companies, and there was a similar theme mentioned of a short term pullback. Reasons to be more optimistic in the medium to long term included a pullback in lumber prices, better weather, and a less competitive mkt in cement. Call to action – High Conviction Stocks – October We currently expect the S&P/ASX200 index to finish the year at 6,300 but the outlook particularly this late in a sustained business cycle is becoming more vulnerable given the prevailing macro-economic risks. Equity market valuations remain stretched and measures of market volatility remain close to all-time lows. We continue to caution investors against complacency and note that avoiding loss is just as important as achieving profits in the current market. We recently highlighted 28 sell or switch ideas that are either vulnerable to ongoing disappointment, worthy of switching on valuation grounds, or worthy of switching into more preferred names in the sector. We add Reliance Worldwide and remove Atlas Arteria this month. Our high conviction stocks are those that we think offer the highest risk-adjusted returns over a 12-month timeframe, supported by a higher-than-average level of confidence. They are typically our preferred sector exposures. Also, we recently nominated 28 stocks (Reporting Season Review) that we believe offer compelling upside post-results. US Market: US stocks slumped as a rise in US Treasury yields to multiyear highs reverberated around the world. European Market: Britain’s top share index suffered its biggest loss since mid-August as rising US yields took their toll with the greatest impact seen across the defensive consumer staples sector. 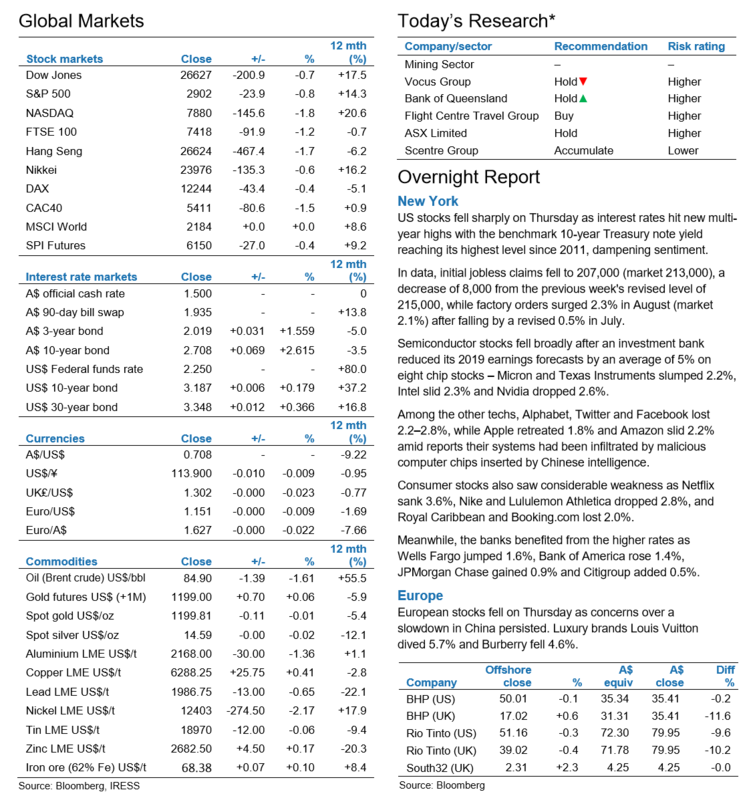 Asian Market: A quiet start turned into a rough day for Asian equities, with the overnight jump in global bond yields and the dollar on strong US jobs data raising concerns about the region. Bank of Queensland (A$11.01) ADD TP A$11.30. No growth on the horizon BOQ has announced FY18 cash earnings of $372m, 2.7% better than our forecast. A final ordinary dividend of 38cps fully franked has been declared. No special dividend has been declared contrary to our expectations. We continue to not foresee any cash EPS growth for BOQ over our forecast period. The dividend yield on offer is the key positive in our investment thesis. A plan to accelerate investment spend has been announced in line with our expectations. Click here for more… Technically Speaking – RWC, RSG, PRU, PAR, RIC Reliance Worldwide (RWC) – Double Blessed Buy. Resolute Mining (RSG) – Tactical Buy. Perseus Mining (PRU) – Bullish breakout. Paradigm Biopharmaceuticals (PAR) – Deterioration in momentum. Ridley Corporation (RIC) – Trim.